For the second straight time, the voters of Davis, who rejected the first three Measure J/ R projects, have approved a project via a Measure R vote. For the second straight time, the vote wasn’t particularly close, belying the heavily contested nature of the election. With 100 percent of the voting reported, the project received 9314 Yes votes to 6917 no votes. While there are undoubtedly a large number of ballots still to be counted in terms of the same day Vote by Mail ballots, the outcome is highly unlikely to change. The initial vote that came in just after 8 pm showed a commanding 59-41 lead. That lead narrowed some in terms of percentage, but it grew in terms of vote margin from 1800 to around 2400 by final verdict. Like most Measure R projects, there is still some uncertainty as the project faces a filed civil rights lawsuit which claims the Davis-based buyer’s program will have a disparate impact that will accentuate existing disparities in terms of minority homeowners in Davis. Opponents fought hard throughout, claiming that the project was exclusionary and it focused heavily on senior housing with 80 percent of the homes reserved for those over the age of 55. Meanwhile, the affordable project was also subject to criticism, despite claims by the city and developers that the 150 units well exceeded the requirements under the affordable housing ordinance. The Vanguard spoke with developer David Taormino before the final results were in. Mr. Taormino was not willing to go so far as to say that Davis had turned the corner in terms of its ability to support housing projects. Councilmember Lucas Frerichs sees the vote reflective of the recognition of a housing crisis that is statewide in nature. Councilmember Dan Carson similarly saw the housing crisis at the root of the success. Councilmember Carson also saw this as continued vindication of the Measure J/R process. The opposition fought this one hard, but they did not have a lot of resources at their disposal. They were badly outspent by the developers – although that has been a usual factor in Measure J/R campaigns which has not proven fatal – and their lack of mounting an effort that could reach out to the community no doubt hurt their cause. As of publication time, they have not sent the Vanguard any sort of statement. Previous : Commentary: Where Will Our Affordable Housing Come from in the Future? See, I was right 57% to 43%. I just got it backwards. I was there for about five minutes, the results came in, I took my photo and went to the next place. It was a different night because the results were obvious as soon as the first returns came in. Yeah, I agree. I saw that after 17% of the votes were counted that the yes side was running about 3 to 2. I knew it was pretty much over then. Usually I try to hit some places early and get photos while people are there and then hang at the close campaign, but there was no close one this time, so I scrambled to get my interviews and get home. Wait . . . What? You are “Yeah, I agree”-ing with yourself? Was something cut that is no longer visible? Otherwise B.P., it appears you are talking to yourself. There must be something seriously wrong with my settings. I see no David. Wonder how much I never see. I do see Greenwald postings, but apparently some I don’t — or SOMETHING. This whole interface s—ks. Did it work here? Would it have worked if the project had been rejected? The key question: what does it mean to work? I’m not sure I agree with Dan here. More on that later. I think Measure R didn’t work in this case as imo the project didn’t deliver the type of housing that Davis really needed, was exclusionary and not dense enough. But I think the No on L side really blew it going down the racism rathole. I feel they turned a lot of people off even in this very liberal city. The campaign throughout used these type of invectives: “misguided” and “illegal” which I’m not sure the voters really bought into. Moreover, they were taking issue with the name, which whether it was a legitimate issue or not, always seemed trivial. This exemplified their problem – they really didn’t have an issue that a large segment of the community was going to rally behind and whatever traction fair housing might have had, was undermined by Gloria Partida’s column and the lack of other people of color speaking out. That said I do think both you and Dan are making the same mistake – outcome based assessments. In this case, I think the problem with Measure R was more process based. I don’t think money effected the vote. The Yes on L campaign maybe had nicer tablecloths and professionally designed and printed flyers, but that is not where people got their information. It was articles, comments and letters on the Davis Vanguard, The Enterprise and on social media sites (Facebook, Nextdoor). 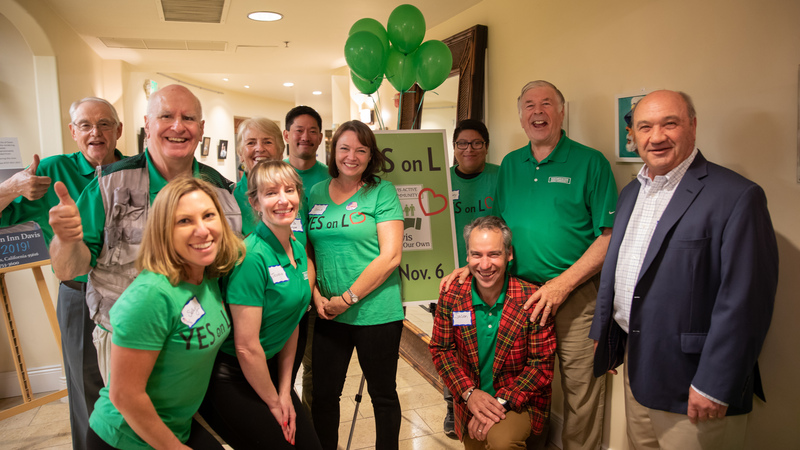 The No on L campaign did a good job saturating their arguments against the project, but the need for housing in Davis was a greater motivation. Even if the No on L campaign had more money, it is difficult to see how they would spend the money to make a difference in people’s minds. A campaign gets outspent by a 30:1 margin and your conclusion is that money doesn’t make a difference? The reason for that conclusion is there has been five Measure R campaigns, all of which spent a lot more than this one and yet the opposition prevailed in three of the five. That suggests that money is not the only factor. Saying “money is not the only factor” is a lot different than saying “I don’t think money effected the vote.” It’s curious that a so-called “People’s Vanguard” would not be more critical of the big-money influence on local politics. Even if the No on L campaign had more money, it is difficult to see how they would spend the money to make a difference in people’s minds. Rik: The data suggest that money isn’t the overriding factor here. I agree with Sharla, the difference between the first three Measure R votes that failed and the last two that passed was not money spent, but rather the salience of the issues to the voters (as described in my analysis). Are you kidding? The average voter isn’t very sophisticated. Sometimes all it takes is a mailer, a knock on their door, a phone call or just a sign to sway them. The No on L didn’t have the funds for that stuff. No on L should have had the funds for that stuff. If Melissa Moreno could raise $17,000 from the community, so could No on L. They would have had enough for a mailer and a walk piece. It’s a matter of organizing. For what it’s worth, my view is that, sure, the spending differential was a factor. But I give credit to the Yes folks for wisely avoiding focusing on the for-sale homes as much as possible, and emphasizing the affordable apartments. That’s why the most visible public spokesperson for the project, particularly in the print media and particularly after the City Council vote, was David Thompson instead of the Taorminos. Whenever the Taorminos got involved, they didn’t make the best impression and often tended to step in it, forcing them to play defense (e.g., with the Taking Care of Our Own slogan and the Davis-Based Buyers’ Program). David Thompson, the affordable housing developer, on the other hand, focused exclusively on the 450 seniors on the waiting list and the 150 affordable apartments WDAAC would provide for 150-170 needy seniors, thereby avoiding all of the issues with the rest of the project (a low density development for financially well-off seniors). It was a smart–albeit less than forthright–strategy, and David Thompson did his job well. I congratulate them. Does anyone know an ATM in town that dispenses fresh $100s? Alan: Start a political blog and advertise/actively campaign for developers. It’s ok, we take credit cards.